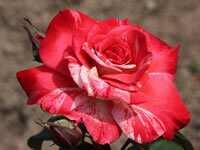 The first question you might ask is what exactly is a hybrid tea rose? 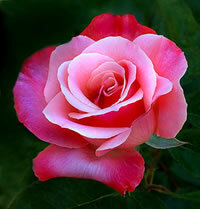 A hybrid tea rose is a cross pollination of an old fashioned tea rose with a hybrid perpetual. This type of rose is by far the most popular rose around the world because they encompass all of the features that one looks for in a rose; beauty, easy maintenance, and great fragrances. One of the more distinct difference between a hybrid tea rose and other types is the fact that a hybrid tea rose will generally only have a single bloom at the end of its long stems. Hybrid teas are the types that you find so many cut flowers from in your local florist's shop. Hybrid teas tend to grow as more open plants, rather than compact bushy varieties. You can expect most types of hybrid tea roses to grow anywhere from 3 feet tall all the way up to 6 feet, depending on growing conditions. 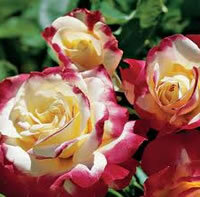 Many people will say that hybrid tea roses are fussy plants and do not grow as well as other types. The fact is more often than not the success of the plant is more a factor of the gardener than the plant itself. Roses are no different than any other type of plant and they require certain growing conditions and some degree of dedication to get them to thrive. The single biggest thing you can do to ensure the success of your roses is to pick varieties of hybrid teas that are suited best for your zone and climate. For instance if you live in a region where your summers are very humid, you will want to search for types of hybrid tea roses that are disease resistant, especially to mildew. Likewise, if your summers tend to be hot and dry most of the time, then pick a variety that has a strong tolerance for heat and drought and has been proven to be a vigorous grower in this conditions. Also pay close attention to the zone ratings on the variety you choose. It will do no good if you choose a variety that can't survive a harsh winter in your area. The right choice of plants goes a long way towards a successful garden, this logic applies to all types of plants. This Jackson and Perkins exclusive is a truly charming flower that produces big and beautiful blooms of lavender to pink. It has a very heady and rich fragrance and while it is a vigorous grower, the plants tends to remain fairly compact. This variety is also well suited for containers, which opens up your options considerably. You can expect this plant to grow approximately 4 to 5 feet tall. In keeping with the wine theme the Merlot is a dreamy variety that no garden should ever be without. The amazing blooms this rose produces can grow as big as 5 inches wide and contain as many as 50 petals. This particular rose has a very light fragrance. The blooms will open up with a stunning rich red that on the backsides have a white frosting that is simply elegant. Another variety well suited to container growing. You can plant this rose on your porch or patio and watch it brighten up the space. This lovely Sangria rose will sport blooms of apricot that slowly change to a deep pink, causing the plant to be covered in multicolored blooms in various stages. 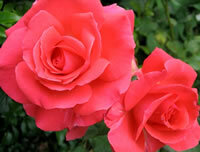 This variety will be a little more compact than other hybrid tea roses, only growing to about 3 feet or 4 feet tall. The sweet fragrance it gives off has a slight hint of cloves and it a splendid addition to any landscape, patio, or garden. This variety will be hardy in zones 5 through 9 and produce flowers up to 4.5 inches wide. The Rosé is an interesting rose that has an absolutely intoxicating damask scent that hints at an infusion of pepper. The two tone blossoms are actually quite stunning with their bubblegum pink petals that are outlines in deep shades of rouge that give a striking appearance. One of the larger blossoming types of hybrid tea roses, the Rosé will provide you with plenty of blooms growing as big as 5 inches wide. The plant does very well in zones 5 through 9, and requires full sun locations to achieve its mature height of 4 to 5 feet tall. I have to admit I'm a huge fan of the Raspberry Swirl hybrid tea rose because of its incredible cream colored stripes that form across the large lush raspberry colored blooms. No two petals on this rose seem to come out the same making this particular variety one that will be sure to hold your attention for a very long time. The leaves on this rose bush will emerge as a deep burgundy color and gradually over time start to fade to green. This is a great container rose with a maximum height of only about 3 to 4 feet tall. The Chivalry hybrid tea is another truly stunning rose that is sure to get anyone's attention who walks past it. The blooms form an average diameter of around 4 inches and they have gorgeous yellow centered petals that are edged in a great light reddish hue, almost giving the flowers an orangeish glow in the centers. 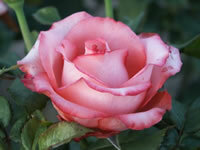 These types of hybrid tea roses are hardier in zones 7 and warmer, and make a great rose bush for cut flowers. Its high resistance to diseases makes Chivalry a proven winner in just about any garden design.